Extremely rare fancy full Accoyo with BLACK skin! With most Accoyos being predominantly white and a few fawn in color, Diamond is truly a rare gem. 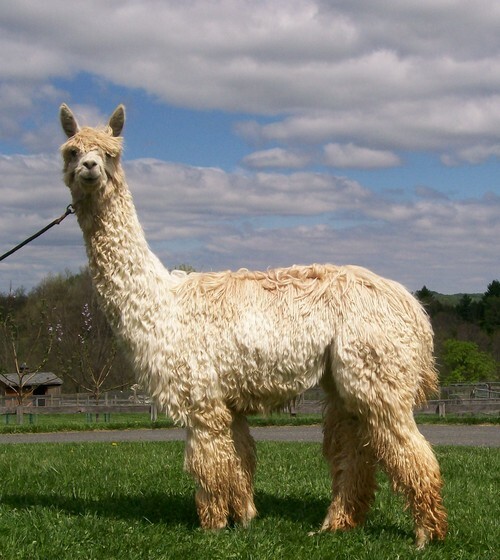 Diamond Dream was bred by Latah Creek Alpacas and is the son of Accoyo Kotzebue LCA. 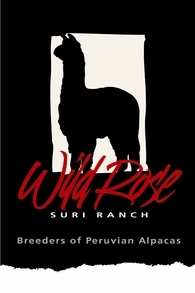 Diamond produces luster, lock, and uniformity in his crias. He is the sire of WRSR Accoyo Moxie (fawn) and WRSR Accoyo Solitaire (fawn). This is the last of his bloodline - he died at his home farm in 2012. Tafetan was one of the top picks form the 4th Peruvian import. 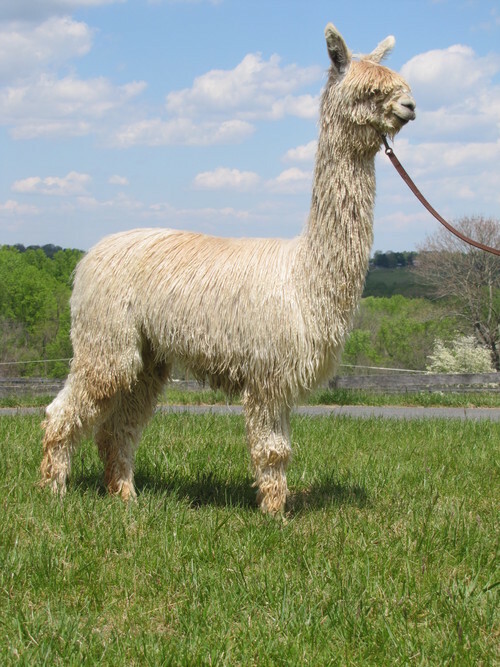 She is full Accoyo bloodlines and is a rare light fawn color and white multi. She has tremendous density and 19.7 micron fiber. 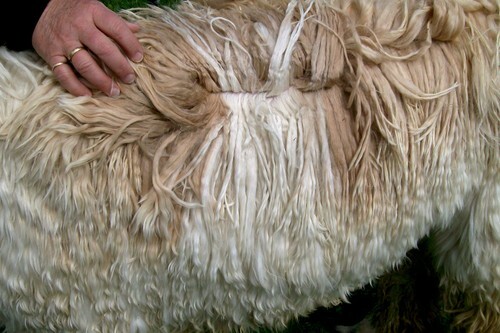 She consistently produces densely fleeced, award-winning offspring, many of them with multiple championships in halter and fleece. Full Accoyo, multi fawn/white, and proven! 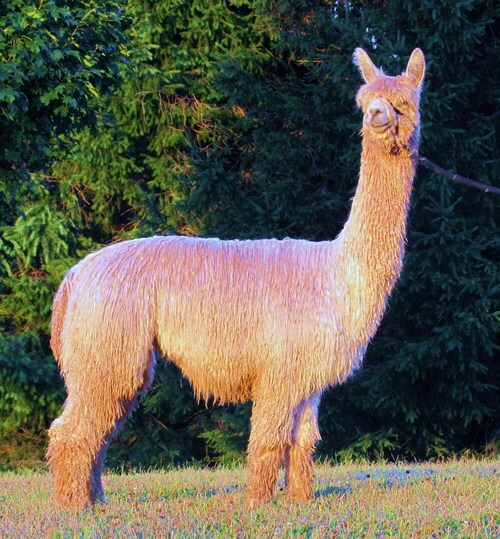 Makenzie is the daughter of LCA Accoyo Diamond Dream, a very fine micron full Accoyo male bred by Latah Creek Alpacas. She is the granddaughter of Accoyo Kotzebue who has produced many champions with density, and fineness. 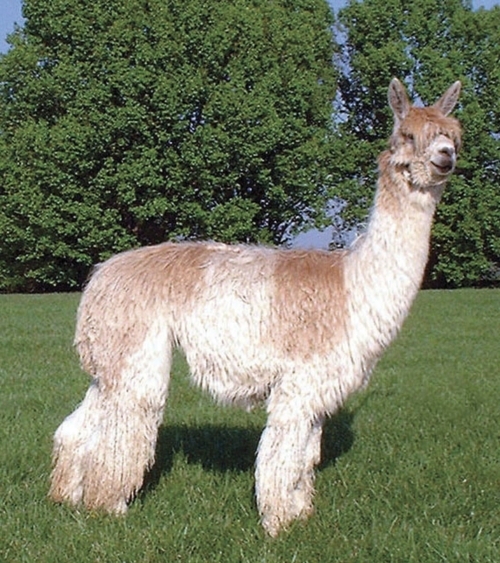 Her dam is 4Peruvian Tafetan de Vainille (Accoyo) who is light fawn with a bit of a pattern herself. Tafetan was one of the lowest micron and densest females on the farm, and she produced champion after champion with each breeding. MaKenzie's multiple champion 1/2 brother is WRSR Accoyo Apocalypse, a light fawn by DDF Accoyo Maurizio producing fineness, high luster, and density. Apocalypse was awarded Fawn Color Champion in his 3rd fleece at the Great Western Alpaca Show in Denver! MaKenzie is proven and had a beautiful daughter by Accoyo Maurizio, a solid light fawn "WRSR Accoyo Solitaire". Check out her listing! She has beautiful fineness, density, and luster and is a solid fawn. She is a strong producer and good mother with plenty of milk. She should produce beautiful crias for many years to come. 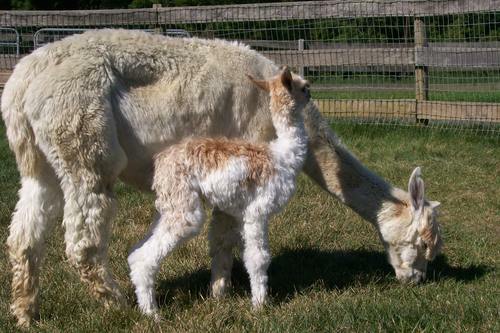 MaKenzie was confirmed pregnant via ultrasound to Shasta Springs Fusion and produced a beautiful, very macho male cria, "WRSR Jack-in-the-Box by Fusion". He was born with a very light beige base color, and several fawn spots. Over the past few months, he has developed light silver grey down his topline and is darkening every day. Surprise! Looks like he will be a light silver grey appaloosa! Check out his listing . . . he is available for sale either separately or with his dam. A discount is given if you purchase both. MaKenzie comes with a complimentary breeding to any Wild Rose herd sire along with 45 days board and a confirmation ultrasound. Call Patti for more information or to schedule a visit : 443-740-4240 (cell).